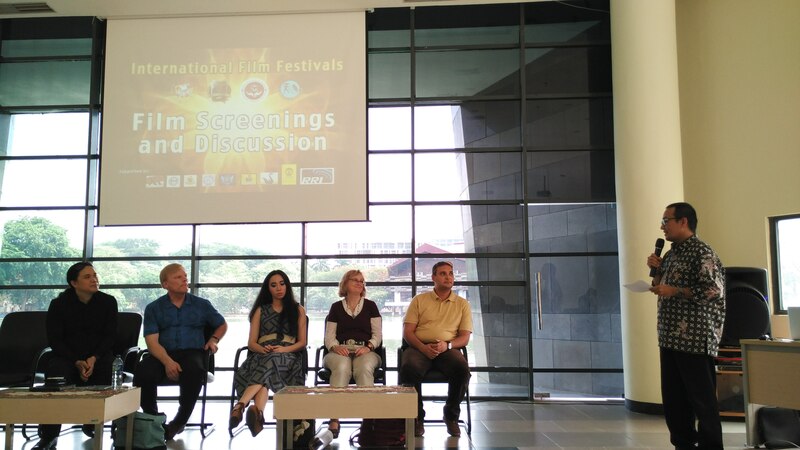 (Jakarta, 11/18/15) International Film Festival for Spirituality, Religion, and Visionary (IFFSRV) concluded its tour today at the lasrgest University in South East Asia. After having film seminar and training with students from High School 7 of Bekasi, today the winners from the festival visited and shared their knowleddes at the University of Indonesia. The University of Indonesia Director of Student Affairs said that they are very honoured to welcome the filmmakers from around he world on the Discussion of International Film Festival : Spirituality, Religion, and Visionary. Now, the young people in Indonesia are aware of film festival as a place to meet and learn from other filmmakers, just like the University of Indonesia that has its own community for film in every faculty and also for cinematography as part of their activity in the university. Because of this reasons, this International Film Festivals would be a special place to meet and learn for the students in the university who loves filmmaking. The films that would be screened in the University of Indonesia mostly would be short films. By that the students can discuss and learn what’s the difference between Indonesian’s short films and films from all over the world. The University of Indonesia also hope that this Film Discussion would give the students more knowledge about filmmaking. “I hope by having this kind of events the young generations from Indonesia will be able to ‘steal’ the knowledge from the international filmmakers and can grow to a better path. I also hope that this events will bring Indonesia’s name to the world” said Damien Dematra as founder and director of International Film Festivals Group. The filmmakers that came to this events are: Judith Morrow the director of The Healing of Heather Garden, Adam Nixon a professor in filmmaking from USA, Richard Wells from USA, Sameh Salem from Egypt who won Best Film in International Film Festival for Peace, Inspiration and Equality 2015 in September and Natasha Dematra a young director from Indonesia who’s also the Ambassador for Tolerance. All winning films will be screened from November 16th until the 1st of December in several High Schools, University of Indonesia and several other screening rooms and theaters. This festival works together with other International Film Festivals such as Filmmakers Of The Year Film Festival (FOTY), International Film Festival for Documentary, Short and Comedy (IFFDSC), International Performing Arts and Movie Awards (IPAMA) and International Students and Newcomer (ISENMA) and held by the Indonesia People’s Creative Council, iHebat International Volunteers, The University of Indonesia, Care for Children Foundation, World Film Council, several High Schools and Radio Republic of Indonesia (RRI) as media partner and organiser.